What would you do if an ancient-looking chair was given to you and was claimed to be made by Jesus Christ? In my review of James’ last novel, Book of Days, I said that it surpassed his debut novel Rooms. Now I say that The Chair surpasses both of those. 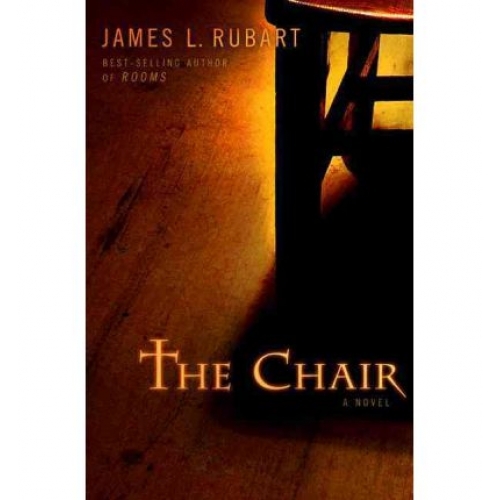 The Chair takes on an Indiana Jones-like feel with one man trying to uncover secrets of an ancient artifact which is said to have supernatural powers. James adds more and more mystery as we delve further into the history of the chair with the main character Corin Roscoe. Is the chair really the work of the hands of the man we know as Jesus? Does it really carry the supernatural power to heal just like its Creator? As with James’ main characters from Rooms and Book of Days, Corin Roscoe has a knack for sports, living on the edge. Yet James accomplishes the task of creating a totally new character on the page without similarities with previous main characters making it hard to believe that the events are happening to a different character. Corin is not a Christian, and when he receives the chair we follow him in his struggles with if God really does exist in a way that is not preachy but laces its way through the story line seamlessly. While some of the characters turn to Christ, others do not, which makes The Chair even more plausible as it does not end off on a totally happy note. The novel ends off with plenty of loss, but there is enough restoration to overcome it. Restoration and freedom is the main themes in all of James’ books, and with each one he shows us another aspect of it. The Chair is definitely my favorite of James’ novels, and I cannot wait for what he has in store for his readers.